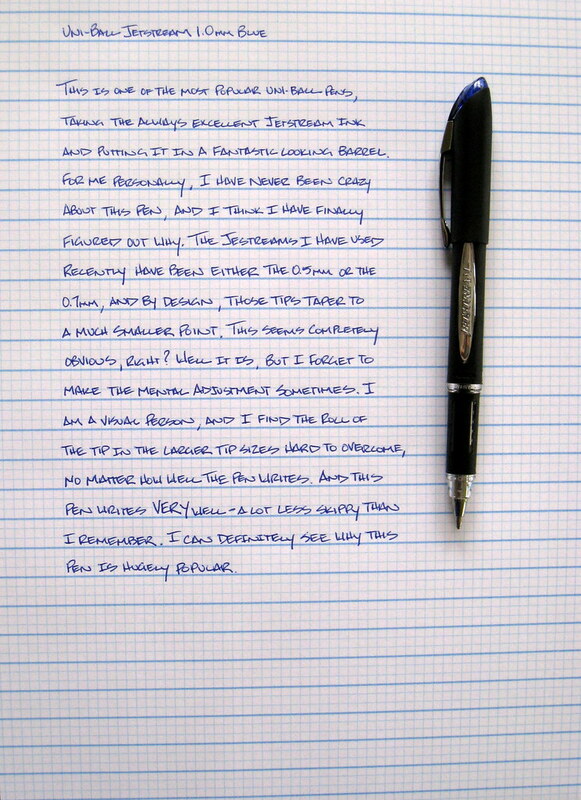 This is the Uni-Ball Jetstream model that most people think of when mentioning this pen, and it is similar to the first Jetstream that I tried when they were introduced to the market many years ago. At that time, I really didn't care for it. I was mostly using 0.5mm Pilot Precise V5 pens, and thought the line was too wide, and skipped to much for regular use. Several newer models got it back in my good graces, so I figured it was time to circle back around and take a look at one of the traditional Jetstreams. Uni-Ball has the best pen barrel design compared to any other brand in my opinion. Their barrels tend to be solidly constructed with good weight, and great functionality. This Jetstream is no different. The pen is perfectly balanced, and the grip area is just right. Combine that with the excellent flow of the ink and you have a very nice pen. From my recollection, this 1.0mm blue ink writes way smoother than the last time I tried this model. That had to be several years ago, and my tastes have probably changed, but you can tell by the picture how well it writes. My preference still lies with the 0.5mm and 0.7mm Jetstreams, but I imagine this is the most popular model off the shelf. Posted on October 7, 2009 by Brad Dowdy.